Join the discussion on our forums! Come discuss Cinderstorm over in our dedicated Cinderstorm discussion topic. I can kinda see why everyone (including me) thought this card was bad but when playing with this card I realized why this is better than arcane missiles. It mostly comes down to the fact that there's not enough value in arcane missiles. Against control, dealing just 3 with empty board is often not enough, you need to pack more punch with your burn. 5 damage for 3 mana seems better in tempo decks where having too many low impact cards makes you more prone to fizzling out in the mid-game. A good comparison is arcane shot vs. kill command or lightning bolt vs. crackle. Against aggro, 3 random damage most of the time leaves minions at 1 health, 2 extra missiles with cinderstorm makes it much more likely to clear minions. 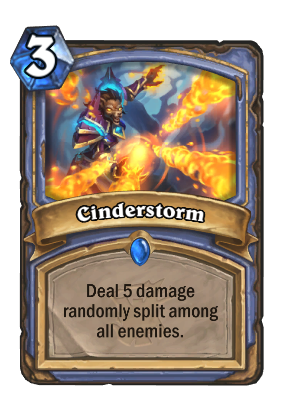 All in all a decent card, certainly helps if the meta has many tokens but even just plain 5 damage for 3 mana on empty board is attractive enough for tempo mage. I suppose the idea is the more damage that gets packed into 1 card, the higher the cost per damage. Despite people saying it is bad, it could certainly help control the early game pretty well or mid game with 2X. Compare to Volcano to really see that value... For just another couple points of mana (depending on how you count overload), you stop the effect from being able to hit your minions and allow it to hit your opponents face, out-valuing even Fireball or Pyroblast on an empty board. This card would be way too good with Echo. Gives new meaning to the description, "terribad"
It's nice face push on empty board but rng factor means that it might not turn into playable aoe clear. Well, the paladin spell is deal 8 dmg for 6 (i don t remember the name, it s "wraith something") arcane missiles is 3 damage for 1 mana. Finally this is 5 damage for 3 mana. So... (8+3+5)/6+3+1= we have an average of 1.6 mana per random damage. Lots of potentials, especially for small tokens & spell damage. What flamewanker should really be. Yes. Yes it is. Other definitions include filler card. Works i guess. wtf is your last 3 dmg?